I am so excited about this DIY chocolate recipe. Not only are the chocolates delicious and my family loves them, but I know they are good for our health too. I highly recommend you try this recipe. I never thought making my own chocolate was so easy. 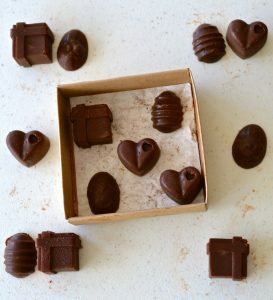 Real chocolate you can make at home with only 3 high quality ingredients and some fun molds. A gluten and dairy free recipe that everyone in your family will fall in love with! It only takes 5 minutes and your DIY Chocolate tastes better than most store-bought versions. If you want to know more about the health benefits of eating cacao, please take a look at my post: Cacao Vs Cocoa: What You Need To Know. You will discover that unfortunately, most chocolates in the market are not real chocolate. Luckily, I was able to find organic cacao powder at Whole Foods but it is also available online. 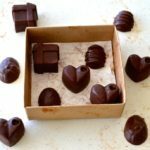 I thought of making my own chocolate and found an amazing 3 ingredient recipe. Yes, only 3 super healthy ingredients. Make your chocolate using fun molds. I used the egg chocolate mold and a heart chocolate mold . You can also simply use a classic chocolate bar mold . Now this is what I call a healthy treat. Eating chocolate can bring health benefits, lots of health benefits! Make sure you choose a virgin coconut oil and raw honey or if you prefer, you can use maple syrup instead. I actually love the texture using maple syrup. So go ahead and try this Mind-Blowing 3 Ingredient DIY Chocolate Recipe! This Mind-Blowing 3 Ingredient DIY Chocolate recipe is so easy to make. Enjoy them plain or add some chopped nuts, raisins, shredded coconut, or some dried fruits. There are so many options and toppings if you want to vary each time you make this delicious treat. Please also see my 4 Ingredient Dark Chocolate Raspberry Hearts recipe. For more ideas on how to incorporate cacao, please see my Cacao Almond Meal Cupcakes With Cream Cheese Frosting and 4 Ingredient Dark Chocolate Hearts recipes. Easy to make and delicious homemade treats for you and your family. Tip: Store your chocolates in the freezer and take them out a few minutes before serving. They taste amazing! With this recipe I made 30 mini chocolates. Delicious real chocolate recipe using cacao and only three healthy ingredients. Vegan, gluten free, dairy free recipe. In a medium size bowl, mix all ingredients. You want to incorporate all ingredients really well. You can whisk by hand or using a hand blender. 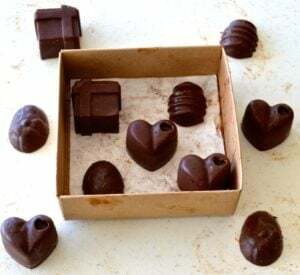 Put the mixture into fun molds (I used the egg chocolate mold and a heart chocolate mold). Place in the freezer for about 2-3 hours. If you are interested in reading more about my blog, please take a look at my latest articles. I am a mom blogger who loves to share creative and healthy family ideas and tips for living a healthy family lifestyle. I would love to know if you liked my recipe. Any other ideas, suggestions or comments are also welcome. You can also find me on Instagram @creativehealthyfamily. I’d come up with a similar recipe on my own but never thought of using candy molds. Your idea is SO much more convenient and attractive! Thank You! I’m glad you liked the idea. I have added 1/2 cup of butter so to make consistency much thicker.my son ryan loves your smiley faced potato i make him in his snacks box. I have a nut and coconut allergy. Any sub for coconut oil ? You could use any flavourless oil, but not olive, as it would make your chocolates taste like olive! I think they use coconut oil here because it is very healthy, but obviously if you are allergic you would be best not using it! Chocolate is my weakness!! This recipe looks like a must try! I’m not a huge honey fan, might try substituting agave nectar. Thank you! You can also use maple syrup! Wow! I can’t wait to try this recipe! Any suggestions for honey substitutes? You can use maple syrup too! You are going to love it ???? Those look delicious and it’s awesome that they are healthy and easy! I’m wondering if someone wants to add mint into this, would you just add a few drops? Hello! Just tried this recipe and it tastes good, but when I took it out the freezer it started to melt. So when i pick up a block to eat, it gets all over my fingers instead of waiting to melt when I eat it. I followed the recipe exactly. Any tips? This recipe was delicious !!!! Thank you! Glad you liked the recipe. Super yummy recipe!! Any tips to keep it from melting so quickly? Or maybe I’m doing something incorrect? Thank you! The chocolates are yummy, we love them too! They do melt quickly, just keep them in the freezer and serve right away. When I keep them in the freezer overnight they do last longer at room temperature. Can I substitute cocoa butter in lieu of the coconut oil? It has a higher melting temp I think? Hi, I haven’t tried using cocoa butter so I would not be able to tell you for sure. But I think it should be ok.